The Rossotto Farm owned by Destefanis family, takes its name from the place located in the town of Montelupo Albese, along the scenic route. Its origins dates back to the beginning of XXth century, but the bottling of the produced wines (Dolcetto and dry Brachetto) started in the Sixties thanks to grandfather Fortunato. It is a family-run wine farm where cultivation methods and wine-making methods have been managed now for 20 years by the graduate enologist and nephew Gianpaolo. 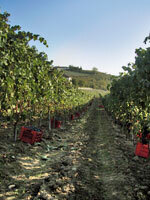 The production of Langhe Chardonnay has been ceased for a number of years.